Recently, India has become a huge backpacking destination internationally. The number of backpackers and explorers looking for getaways especially in northern India is on the rise. As a result, the popularity of Kasol is one the rise. 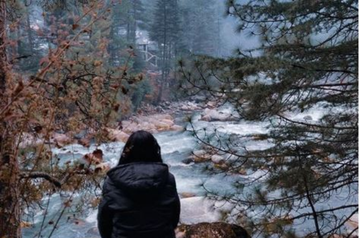 Kasol is a village straight out of a postcard in the valley of the Parvati river in Kullu. It is no surprise that it is on everybody’s bucket list. And Kasol does not disappoint. This picturesque little village is located about 40 km away from Bhuntar Airport. No matter what you’re looking for, Kasol offers a treat to the mind and soul. From hot water springs to abundant treks and mini hikes, beautiful villages to unmatched local hospitality, flavorsome food to roaring rivers - you’re sure to find it all here. It truly is a wonder to behold. There is magic in the air at Kasol, which has a calming yet energizing effect at the same time. No matter how old you are or what kind of traveller you are - there is something for everyone here. Kasol makes you feel like everything is possible. Old and New Kasol are separated by a small bridge which looks like a fairytale village. There are tons of cafés to sample some of the famous Israeli food. Plus, it is immensely safe and this makes it an ideal destination for a solo female traveller. Kaanchi Duggal, a media professional from Mumbai recently travelled to Kasol and had the time of her life. “We stayed at Whoopers Hostel. It has a Game of Thrones theme! It is by the Parvati river. We reached there late at night and had no idea what the surroundings looked like. The next morning we woke up to a river with a bridge over it, donkeys crossing over carrying their loads and trees shedding their autumn leaves. It was breathtaking!” she says. If you’re already dreaming of escaping to Kasol, here’s a handy guide that will help you have the trip of your life. We’re compiling the top 13 experiences that you absolutely cannot miss out on when you’re solo travelling in Kasol. The biggest attraction for most people coming to Kasol is the Kheerganga trek. It is a small village far away from the restrictions of a 9-to-5 life. The trek starts from the base camp at Tosh which is about 13 km or one local cab ride away from Kasol and lasts about 6-7 hours. It is pretty exhausting but worth every second. The views from the top are spectacular. The natural beauty is unmatched. Besides Kheerganga boasts of hot springs with medicinal properties that are known to rejuvenate senses and cure pain. There's no excuse not to do it now! The base camp for the Kheerganga trek Tosh is a gorgeous village by itself and is well worth a pit stop. You can choose from tons of options when you’re looking for a place to live in. Some of the famous ones are Pink Floyd Café, Mountain Goat Café, Shiva Mountain and Olive Garden. If you’re not exhausted from the Kheerganga trek you can do a small easy trek here to the Kulta glacier. Or you could let it all go and spend the day unwinding in nature, lying in the grass and gazing at the glorious Himalayas. Tosh offers majestic sunrise and sunset views which you absolutely cannot miss. Close to Tosh, the village of Malana may be famous for its controversial cannabis but it is worth a stop even if you’re keeping your trip strictly PG - simply to see the way of life of the locals. It is a prehistoric village known for its outlying environment that is disconnected from the rest of the world. It is not very accessible as a place because the locals consider themselves to be descendants of Alexander the Great and thus a superior race. While the validity of this is much debatable, it doesn’t stop them from having their own language, festivals and way of life that involves no interaction with anyone from the outside. Sounds awesome? You should see it for yourself. Jhalak Doshi, a Goa-based tattoo artist, and frequent traveller strongly recommends treading along the Parvati to reach Chahal about 30 minutes away and living there. It is a little off the beaten track and is ideal if you’d like to escape the crowds and find some hidden gems. Besides, it offers unimaginably gorgeous panoramic views. Step into one of the cafés that serve scrumptious food that us a blend of Indian and Israeli spices and watch the sunset. Chalal is also very famous for its parties. DJs from across the world come here and perform some mind blowing curated music. If you haven’t pitched a tent yet, Kasol is probably where you should start from. Emerald green hills with the river roaring by, make this the perfect backdrop for your camp. You can choose to camp by the riverside, in the Tosh Valley or even at the top of Kheerganga, there is no dearth of places where you can choose to pitch your tent for the night as you sleep looking at a sky full of stars. Kasol’s best-known café is a must visit on every tourist’s list. Moon Dance Café has an unmatched view of the mountains and valleys which makes it an amazing spot to have deep conversations. You can even get some amazing pictures for your Instagram! Try their excellent food including fresh bread rolls, scrambled eggs and so much more. It is the ideal breakfast and brunch spot at dirt cheap prices. While we are talking about food, you must try the Israeli fare here, especially the shakshouka and the lemon cakes. Jhalak has a host of other recommendations too, “You must have Lalloo's famous milkshakes and Caesar salad by the river, at Sony Cottage and Restaurant. You must have Momos at the stall opposite German bakery. Indulge in amazing Nutella crepes, waffles and croissants at Crepes and Waffles. Socialize at Jim Morrison Cafe. Eat mouthwatering chaat while talking to Saadhus right before the Chalal bridge.” she says. Your food scene is sure to be sorted for the duration of the trip with this list of must-tries. “Walk up the path of the Parvati river and you’re sure to run into a wandering masseur with his kit of tiny oil bottles. Get a foot and back massage by the river.” Jhalak says. A massage by the river after days of trekking. Show me where can I sign up! Psytrance or Psychedelic Trance, a specific genre of trance music is becoming popular across the world. Kasol is India’s psytrance capital and hosts some of the craziest festivals in this genre around the valley in very offbeat locations. Whether you’re a first-timer or a veteran you will not be disappointed by the parties. April and May are the best time to go for the Psy parties in Kasol. Plus it is the peak of summer in India so getting away to the mountains during that time seems like a much-needed respite. Explore Kasol’s spiritual side at Manikaran Sahib, a Gurudwara located about 6km from Kasol right in the middle of the Beas River. No matter what religion you belong to, heading here is a must for everyone on a trip to Kasol. It’ll give you a chance to connect with your own soul and find some inner peace. It is almost therapeutic. You can also try the delicious food in the Langar which is cooked purely in this holy place. When visiting the Gurudwara, you also have to check out the hot springs. These are natural hot springs considered sacred in the Hindu and Sikh culture. A bath in these springs is considered to wash all your sins and wrongdoings away. The water also has medicinal and rejuvenating properties. Pilgrims even cook rice in the hot springs to offer to the deities. Don’t worry, we aren't asking you to drink alcohol! Kasol’s Rice beer is famous all over the world for its delicious taste and zero alcohol content. It is locally called ‘Chang’ and is a must try on your trip. You may not find it very easily but the locals or your hosts will be happy to procure some for you. Take a swig and tell us how you like it! What is a trip without any souvenir of our time there? Your trip to Kasol deserves a great piece of memorabilia that you can easily find in the streets of Kasol. You can pick up several things ranging from semi-precious stones, t-shirts, and woolens to aromatic oils, carpets, sheets, rugs and more. Find something that sums up the place and your experience for you. That way a piece of Kasol will remain with you forever. By Air: The closest airport to Kasol is the Bhuntar airport which is about 30 km away. By Rail: Joginder Nagar railway station is the closest at about 144kms from where you can hire a bus or a cab to get to Kasol. By Road: There is no direct bus to Kasol from Delhi, but you can get on a bus to Bhuntar from Delhi/Chandigarh and get another bus or local taxi to reach Kasol. So what are you waiting for? Plan your next solo trip now! Great description....I am almost planning my trip. Any group visiting this place? Hi which site is this? they have more trips planned?